Oops - we don't appear to have a video for the DocuMate 510. This scanner is one step up from the run-of-the-mill flatbed you might buy for home or (very) occasional small office use. The most obvious difference is an automatic document feeder that is integrated into the lid and works well up to around 50 sheets of paper. I found this great for archiving away all those old paper-based notes that I will *probably* never look at again but was reluctant to throw away. album) but unfortunately this is where the feeder hits its limits. It does cope sometimes but it is definitely not possible to put a whole stack of photos into the feeder for unattended scanning. So back to using the machine as a flatbed for such purposes. I found the image quality of the Documate 510 more than adaequate. Unfortunately, as with most other scanners, the speed drops dramatically for higher resolutions. I do a lot of black-and-white scanning, and it is a pity that 300dpi goes so much slower than 200dpi. Praise for the bundled software (Paperport Pro): The user interface is logical and easy to use - an example are the dialog boxes for manual duplex scanning. The one thing that is missing (or maybe I have not found it yet) is an easy way of adding an empty page to a multi-page scan. Why would anyone want to do that? Well, it helps work around a "feature" of some printer drivers when printing double- sided. If the number of pages is odd, the last page of one print-out ends up on the same page as the first page of the next one. Finally, a hint that may help someone preserve their sanity: On my not-so-recent PC, it turned out that the scanner worked fine on the USB ports at the back of the PC but not on those at the front (where it just twitched a bit but did not scan). So if going through the (pretty decent) Xerox troubleshooting guide does not make a difference, there is another thing to try. I would rate the scanner as excellent value for money. The automatic document feeder is very reliable and quick. Also the software is excellent and the Textbridge package is very useful as it allows you to convert the text of a scanned document into word format for subsequent editing. Better than faxing and if desired documents scanned in can then be altered without having to be re-typed (making my secretary happy by saving her time). The document feeder makes this machine invaluable to a busy office compared to a pure flatbed scanner. Your service is highly rated, very professional and would very much recommend. A very good value for money scanner, that gives excellent results for bulk scanning documents. The hopper does not have a massive capacity, but it doesn’t matter if only scanning hundreds rather than thousands of documents. The scanner is shipped with some good software that enables you to easily process the scanned documents. We purchased the Xerox DocuMate 510 to help with the growing need to scan and store all our companies documents in a fast efficient manner, the Xerox DocuMate 510 achived and surpassed all our expectations, it scans quickly and efficiantley with no jams. We recently purchased a Documate 510 for use in our business. It has been a brilliant purchase for us. It has saved so much time and made this process so much easier. The quality of the scanned items is excellent, the software is easy to use and the document feeder has handled everything we've thrown at it so far. All in all, it's a great piece of kit - high quality at an amazing price - great value for money. The Visioneer Xerox DocuMate 510 document management scanner is a compact and effective hi-speed scanner perfect for workgroups and other decentralized scanning applications. By eliminating seldom used options such as duplex capability and a SCSI interface, Xerox offers this model at a price that enables businesses to achieve high levels of productivity by distributing fast cost-effective scanners throughout the organization. 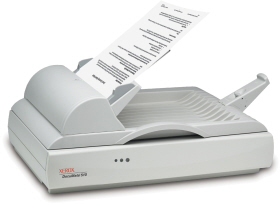 The DocuMate 510 has a 50-page Automatic Document Feeder that scans 10 pages per minute. It features 600x1200 dpi optical resolution, 42-bit color, USB interface and scans everything from photos up to legalsized documents. It also features one of the smallest footprints available of any businessoriented flatbed scanner on the market. The DocuMate 510 includes TWAIN and Certified ISIS® Drivers plus the following software. PaperPort Deluxe 9 by ScanSoft is the easiest way to turn volumes of paper or photos into organized digital files that you can quickly find, use and share. PaperPort's native support for the standard PDF format brings you the power to scan, annotate and email documents and photos in a format that ensures everyone can view and print them on any computer. Stop wasting time looking for paper documents scattered around your home and office. ArcSoft PhotoImpression allows you to edit, retouch, and enhance images simply and quickly. Apply special effects with point-n-click interface. Numerous templates for cards and calendars are included.